The two-decade-long dispute on the statute of the Caspian Sea, the world largest water reserve, came to an end last Sunday when five littoral states (Russia, Iran, Turkmenistan, Kazakhstan and Azerbaijan) agreed to give it a special legal status – it is now neither a sea, nor a lake. Before the final agreement became public, the BBC wrote that all littoral states will have the freedom of access beyond their territorial waters, but natural resources will be divided up. Russia, for its part, has guaranteed a military presence in the entire basin and won’t accept any NATO forces in the Caspian. 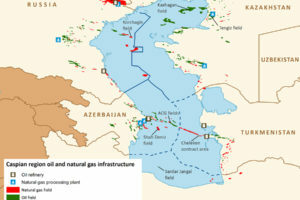 Russian energy companies can explore the Caspian’s 50 billion barrels of oil and its 8.4 trillion cubic meters of natural gas reserves, Turkmenistan can finally start considering linking its gas to the Turkish-Azeri joint project TANAP through a trans-Caspian pipeline, while Iran has gained increased energy supplies for its largest cities in the north of the country (Tehran, Tabriz, and Mashhad) – however, Iran has also put itself under the shadow of Russian ships. This controversy makes one wonder to what degree U.S. sanctions made Iran vulnerable enough to accept what it has always avoided – and how much these U.S. sanctions actually served NATO’s interests. If the seabed, rich in oil and gas, is divided this means more wealth and energy for the region. From 1970 until the dissolution of the Soviet Union (USSR) in 1991, the Caspian Sea was divided into subsectors for Azerbaijan, Russia, Kazakhstan and Turkmenistan – all constituent republics of the USSR. The division was implemented on the basis of the internationally-accepted median line. After the dissolution of the Soviet Union, the new order required new regulations. The question was over whether the Caspian was a sea or a lake? If it was treated as a sea, then it would have to be covered by international maritime law, namely the United Nations Law of the Sea. But if it is defined as a lake, then it could be divided equally between all five countries. The so-called “lake or sea” dispute revolved over the sovereignty of states, but also touched on some key global issues – exploiting oil and gas reserves in the Caspian Basin, freedom of access, the right to build beyond territorial waters, access to fishing and (last but not least) managing maritime pollution. The IEA concluded in World Energy Outlook (WEO) 2017 that offshore energy has a promising future. More than a quarter of today’s oil and gas supply is produced offshore, and integrated offshore thinking will extend this beyond traditional sources onwards to renewables and more. 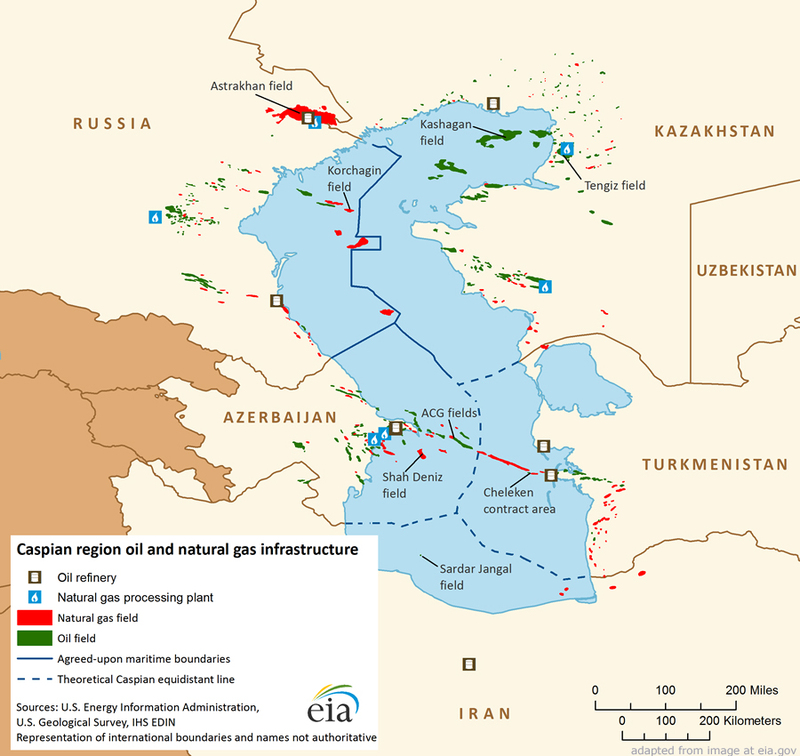 Caspian offshore hydrocarbon reserves are around 50 billion barrels of oil equivalent (equivalent to one third of Iraq’s total oil reserves) and 8.4 trillion cubic meters of gas (almost equivalent to the U.S.’ entire proven gas reserves). As if these quantities were not themselves enough to rebalance Eurasian energy demand equations, the agreement will also allow Turkmenistan to build the Trans-Caspian pipeline, connecting Turkmenistan’s resources to the Azeri-Turkish joint project TANAP, and onwards to Europe – this could easily become a counter-balance factor to the growing LNG business in Europe. Even though we still don’t have firm and total details on the agreement, Iran seems to have gained much less than its neighbors, as it has shortest border on the Caspian. From an energy perspective, Iran would be a natural market for the Caspian basin’s oil and gas, as Iran’s major cities (Tehran, Tabriz, and Mashhad) are closer to the Caspian than they are to Iran’s major oil and gas fields. Purchasing energy from the Caspian would also allow Iran to export more of its own oil and gas, making the country a transit route from the Caspian basin to world markets. For instance, for Turkmenistan (who would like to sell gas to Pakistan) Iran provides a convenient geography. Iran could earn fees for swap arrangements or for providing a transit route and justify its trade with Turkey and Turkmenistan as the swap deal is allowed under the Iran-Libya Sanctions Act (ILSA, or the D’Amato Act). If the surface water will be in common usage, all littoral states will have access beyond their territorial waters. In practical terms, this represents an increasingly engaged Russian presence in the Basin. It also reduces any room for a NATO presence, as it seems to be understood that only the five littoral states will have a right to military presence in the Caspian. Considering the fact that Russia has already used its warships in the Caspian to launch missile attacks on targets within Syria, this increased Russian presence could potentially turn into a security threat for Iran. Many questions can now be asked on what Tehran might have received in the swap but one piece of evidence for what might have pushed Iran into agreement in its vulnerable position in the face of increased U.S. sanctions. Given that the result of those sanctions seems to be Iran agreeing to a Caspian deal that allows Russia to place warships on its borders, remove NATO from the Caspian basin equation, and increase non-Western based energy supplies (themselves either directly or indirectly within Russia’s sphere of geopolitical influence) it makes one wonder whose interests those sanctions actually served?